Recommended Citation: Peslak, A R. Welcome to CONISAR 2009 Washington D.C. In The Proceedings of the Conference on Information Systems Applied Research 2009, v 2 (Washington DC): §2115. ISSN: 0000-0000. 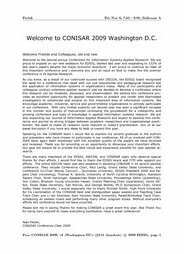 Welcome to CONISAR 2009 Washington D.C. Welcome to the second annual Conference for Information Systems Applied Research. We are proud to expand on our new endeavor for EDSIG, started last year and expanding to 133% of last year’s papers despite the major economic downturn. I am proud to continue as chair of this important conference and I welcome any and all input on how to make this the premier conference in IS Applied Research. As you know, as a result of our continued success with ISECON, the EDSIG board recognized the need for a conference that dealt with not just educational and pedagogical research but the application of information systems in organizations today. Many of our participants and colleagues conduct extensive applied research and we decided to develop a conference where this research can be reviewed, discussed, and disseminated. We believe this conference provides an excellent opportunity for applied researchers to present and confer with likeminded investigators to collaborate and expand on this important area of information systems. We encourage academic, industrial, service and governmental organizations to actively participate in our conference. With very limited publicity our second year has seen a significant increase in the number and quality of manuscripts continuing the groundwork for a noteworthy and growing conference and body of knowledge in applied information systems research. We are also expanding our Journal of Information Applied Research and expect to develop this conference and journal as strong bridges between academic researchers and organizational practitioners. We want to make IS research more relevant to today’s practitioners. Join us at our panel discussion if you have any ideas to help us toward this goal. Speaking for the CONISAR team I would like to express my sincere gratitude to the authors and presenters who have chosen to participate in our conference. All of us involved with CONISAR have again been impressed with the excellent quality of the papers we have received and reviewed. Thank you for providing us an opportunity to showcase your important efforts. Our goal will always be to provide the best venue and experience possible for your applied research. There are many members of the EDSIG, ISECON, and CONISAR team who deserve special thanks for their efforts. I would first like to thank the EDSIG board and FITE who support our efforts. The entire ISECON team was also essential in assisting CONISAR in its second parallel conference. They include Conference Chair, Paul Leidig, Grand Valley State University, and Conference Co-Chair Wendy Ceccucci , Quinnipiac University, EDSIG President 2009 and Papers Chair (reviewing), Thomas N. Janicki, University of North Carolina Wilmington, Assistant Papers Chair, Scott Hunsinger, Appalachian State University, Proceedings Editor (publishing), Don Colton, Brigham Young University Hawaii, Events Planning Chair (operations), Kevin Jetton, Texas State University, San Marcos, and George Nezlek, Ph.D Symposium Chair, Grand Valley State University. I would especially like to thank Michael Smith, High Point University for his coordination of the CONISAR best and distinguished paper awards and Teaching Case Track Chair and Li-Jen Shannon, Sam Houston State University, Panel/Workshop Track Chair, scheduling all session chairs and performing many other program duties. Without everyone’s efforts this conference would not have occurred. Please join me in saying Thanks for making CONISAR a great event this year. And Thank You for being here yourself to make everything worthwhile. Have a great conference!